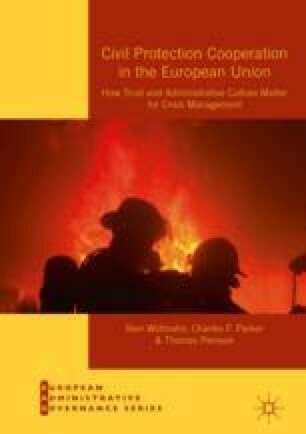 In this chapter, the authors investigate the extent to which social capital and the structure and culture of public administration correlate with perceptions of the effectiveness of civil protection at both national and EU levels. They address this issue with the aid of survey data to shed light on how practitioners and officials working with civil protection think about the performance and effectiveness of agencies in this area. The main finding is that both trust-related and organizational factors matter for perceived effectiveness. The results show that, if civil protection is to work well and to be perceived as effective by those working in the area, then social capital in the form of trust is vital: trust levels must be high, loyalty prized, and professionalism valued. Organizational factors are clearly crucial too: in particular, the importance of hierarchy and rule-governance stands out. Parker, C. F., Persson, T., & Widmalm, S. (2018). The Effectiveness of National and EU-Level Civil Protection Systems: Evidence from 17 Member States. Journal of European Public Policy. https://doi.org/10.1080/13501763.2018.1523219.